Ship cruises and ferries at the best! Find out the best ship cruises worldwide here on our websites! 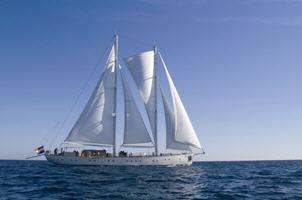 Sailing Yacht KAIROS is a Dutch built Schooner of 38 meters or 124,7 feet in length which was built in 2007. 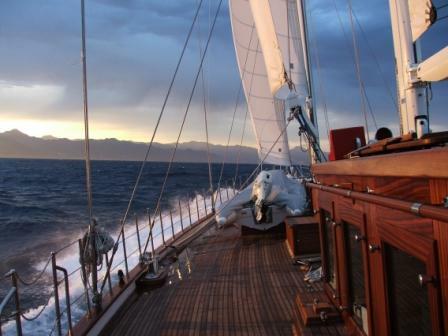 S/Y KAIROS is available to charter in the western Mediterranean countries, such as France, Italy, Sardinia etc, and provides accommodation for an unusually large number of guests. The yacht can accommodate up to 18 guests in 9 cabins in a 7 double and 2 twin configurations. KAIROS ‘s cabins have air-conditioning and en-suite bathrooms. Her large salon offers plenty of space for meals, meetings and entertainment. On the aft deck 18 guests can also dine comfortably for large social gatherings. In addition, the large schooner sailing yacht can take up to 30 guests for day sailing and approximately 50 guests for cocktails alongside quay. 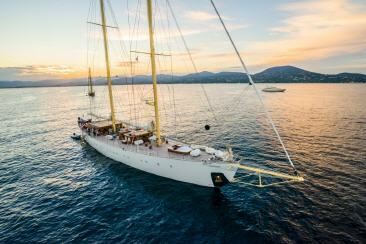 Accordingly, KAIROS is ideal for events with her enormous deck space and classic traditional sailing yacht feel. Sailing Yacht KAIROS has spacious double cabins with air condition and own bath and shower accommodate a max of 18 passengers overnight. The large salon offers plenty of space for meals, meetings and entertainment. On the aftdeck 18 guests can dine comfortably. 7 double cabins (11m⊃2;)with queensize beds 2 cabins (8m⊃2;) with single beds (upper and lower) Big Plasma TV in the salon for presentations and entertainment. Buchen Sie Ihre Traumkreuzfahrt mit der Queen Mary 2 direkt online! Come on board the Amethyst **** on a romantic Danube River cruise. Here you can "experience" the cities of Passau-Vienna-Budapest-Bratislava-Wachau. You may booking your passage here online, just click the photo or the cruise name. The luxery collection of greatest cruise liner: Cunard "Queen Mary" or Royal Caribbean all online booking by e- hoi. ...and much more shipping companies! Just under this script.